Kitty O Retro | Alley Cats Retired Figurines | One Price Low Flat Shipping! From the Alley Cats Collection by Margaret Le Van, Kitty O Retro. Made of hand-painted resin. Measures 7.5" tall. 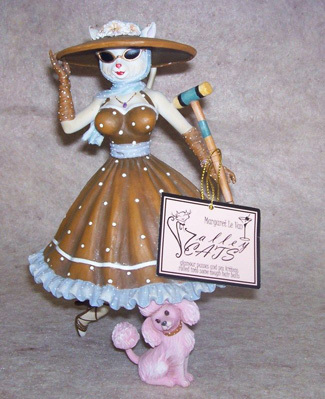 This high society kitty by Margaret Le Van is holding a polo mallet and is wearing a stylish brown polka dot dress, a blue scarf, and a fashionable wide brim hat. She is also accompanied by her treasured pet pink poodle. Great Gift, Great Margaret Le Van Collectible. Manufactured by Artisan Flair. Brand new in original packaging.